Dwyane Wade was greeted with plenty of video tributes ahead of, and during, his final home game on Tuesday night in Miami - including a special message from Barack Obama. The coolest video package came from Wade's 17-year old son, Zaire, who recreated his father's iconic Converse commercial. 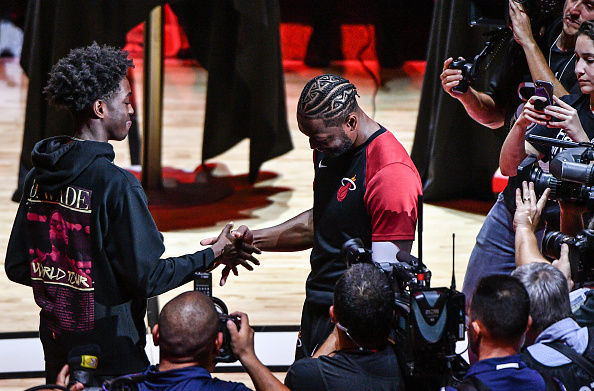 Not only did Zaire take part in the shot-for-shot remake, but the Heat also used it to introduce D-Wade to the Miami Heat crowd for the last time in his 16-year NBA career. Wade led all scorers with 30 points as the Heat picked up a 122-99 victory over the Philadelphia 76ers in his last go around American Airlines Arena. However, the Detroit Pistons came back to defeat the Memphis Grizzlies on Tuesday night, which eliminated Miami from playoff contention. As a result, Wednesday night will mark the final game of Wade's Hall of Fame career. The Heat will take on the Nets in Brooklyn for game 82. If last night's game was any indication, we expect to see D-Wade break out some special edition colorways of his Way of Wade 7 signature sneakers.